Substantial pale champagne golden healer crystal is multi-terminated and color changes from clear to palest yellow tint as it is turned. 7/8x 1-1/8x 2-1/2", its' large channel face shows holograms when light reflects from it. Quite clear, you'll be able to easily see some of its' drusy right through it. Record keepers at each end, and small bright rainbows. 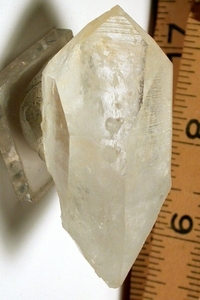 From the type locality of Collier Creek, Arkansas.